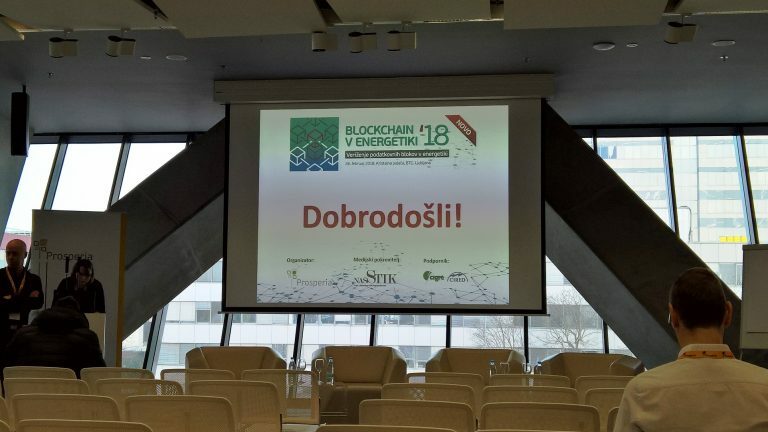 Potential of blockchain technology, cryptocurrencies and their added value in energy systems were the main topics of the first Slovenian conference Blockchain in Energy ’18, which was attended also by our team. Organizer of the event, Prosperia company prepared interesting program to present the changes, which new technologies and innovative blockchain business models will bring to the companies involved in power systems operations. New business models, actors and trends for energy sector, ICO tokens were presented by dr. Peter Merc from Lemur Legal Company and Mr. Igor Zgonc, CEO at Silver Bullet Risk. Sessions about blockchain technology and other new solutions such as Internet of Things (IoT) were held by Mr. Gregor Sajovic from netis and dr. Matevž Pustišek from Faculty of Electrical Engineering at University of Ljubljana. Successful entrance to the crypto and blockchain world as one of the first in the sector was presented through his own experience by Mr. Damian Merlak, founder of Bitstamp and Tokens.net cryptocurrency exchanges. Implementation of blockchain technology in energy markets was presented by Mr. Erwin Smole from Grid Singularity company, which develops smart network solutions, decentralized trading and smart contracts, based on blockchain technologies. Pros and cons of the smart contract, decentralised trading and cryptocurrencies from the legal perspective were presented by Aljaž Jadek from Jadek & Pensa Law Office. 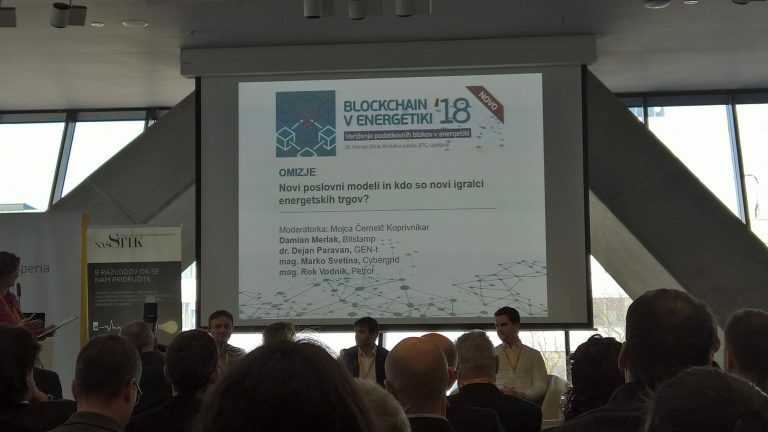 First implementation of blockchain technology in energy system is important research topic for Slovenian energy companies. Development of new business models and new technology implementation at PETROL was described by their Member of the Management Board, Mr. Rok Vodnik. SunContract platform, which enables peer to peer trading based on blockchain technology is product of SONCE Energija company, owned and presented by Mr. Gregor Novak. European Horizon projects, FutureFlow and Crossbow develop new ancillary services, cross border trading and market coupling. Role of new technologies in the projects were presented by Mr. Peter Nemček, Co-founder of cyberGRID, which is involved, together with some other Slovenian companies, as a partner in both projects. Project FutureFlow is coordinated by ELES, GEN-I is also partner in the consortium. In CROSBOW, two departments of University of Ljubljana are involved as well: Laboratory of energy policy from Faculty of Electrical Engineering and Laboratory for Integration of Information Systems from Faculty of Computer and Information Science. Role and potential of blockchain technologies at GEN-I were presented by Mr. Sandi Kavalič. Successful implementation of blockchain in his business was achieved also for Mr. Žiga Drev, founder of OriginTrail, which deals with supply chain monitoring for food industry. Blockchain in energy ’18 was first of this years meetings where role of new technologies in energy sector was discussed with many others to follow.